Place the tempeh in a sauce pan with broth. Toast the cumin and coriander seeds in a dry skillet for just 2 minutes, just to bring out the flavor. Tie in a small piece of cheese cloth with the cilantro and hot pepper. Add this to the tempeh, simmer, covered, 20 minutes. Allow the tempeh to cool in the broth, then remove with a slotted spoon. Set aside. Place eggplant in colander. Toss with coarse salt, let sit for 1 hr. Pat dry. Heat 1/4 c. oil in large flameproof casserole. Add onion, zucchini, bell peppers, garlic. Sauté for 10 minutes. Place remaining 1/4 c. oil in skillet, cook eggplant over medium-high heat until tender. Using slotted spoon, transfer eggplant to casserole. Add tomatoes, broth, 1/2 c parsley, basil, and spices to casserole. Cook over low heat for 30 minutes. Stir occasionally. 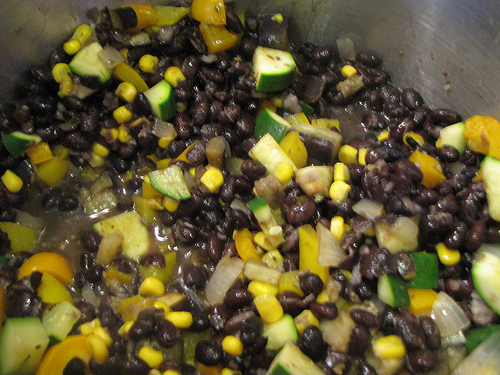 Add black beans, corn, dill, lemon juice. Add tempeh. Cook for 15 minutes. Adjust seasoning, add 1/2 c. parsley. Serve hot with garnishes.